Sixteen-year-old Clary Fray is an ordinary teenager, who likes hanging out in Brooklyn with her friends. But everything changes the night she witnesses a murder, committed by a group of teens armed with medieval weaponry. The murderous group are Shadowhunters, secret warriors dedicated to driving demons out of this dimension and back into their own. Drawn inexorably into a terrifying world, Clary slowly begins to learn the truth about her family - and the battle for the fate of the world. 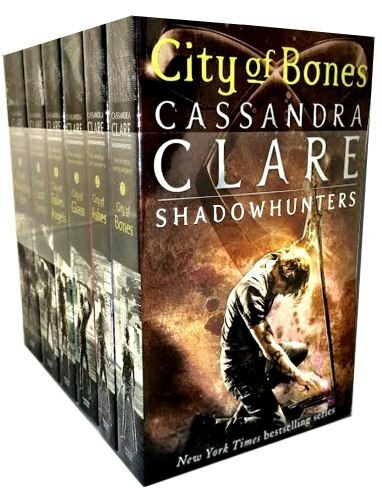 With her mother in a coma and her father hell-bent on destroying the world, Clary is dragged deeper into New Yorks terrifying underworld of werewolves, demons and the mysterious Shadowhunters. Discovering the truth about her past was only the beginning, now Clary must save the world from her own father " the rogue Shadowhunter Valentine. With two of the Mortal Instruments at his command, Valentine is assembling an army of demons to wage war on the council of Shadowhunters and destroy them once and for all. As the battle begins, Clary must face her darkest fears " and come to terms with her feelings for a boy she wishes wasnt her brother. This title is the third and final instalment in the bestselling urban gothic fantasy sequence, "The Mortal Instruments". With two of the Mortal Instruments now in Valentine's hands, the world of the Shadowhunters teeters on the brink of civil war. Jace and the Lightwoods are recalled to Idris, the Shadowhunters' remote and hidden home country, where a search has begun for the last of the Instruments, the Mortal Glass. Clary finds herself caught up in the chaos as the delicate social order of the Nephilim begins to shatter, pitting Downworlder against Downworlder and Shadowhunters against each other. When the City of Glass falls under attack, can Downworlders and Nephilim fight together to defeat Valentine, or will their longstanding hatred destroy them all? And when Clary discovers the unbelievable truth about her own past, can she find Jace before it's too late? Clary and the Shadowhunters struggle to piece together their shattered world after a betrayal by one of their own leaves them reeling. The Mortal War is over, and sixteen-year-old Clary Fray is back home in New York, excited about all the possibilities before her. She's training to become a Shadowhunter and most importantly of all she can finally call Jace her boyfriend. But nothing comes without a price. Someone is murdering the Shadowhunters who used to be in Valentine's Circle, provoking tensions between Downworlders and Shadowhunters that could lead to a second, bloody war. And when Jace begins to pull away from her without explaining why, Clary is forced to delve into the heart of a mystery whose solution reveals her worst nightmare: she herself has set in motion a terrible chain of events that could lead to her losing everything she loves. Even Jace. Darkness has descended on the Shadowhunter world. Chaos and destruction overwhelm the Nephilim as Clary, Jace, Simon, and their friends band together to fight the greatest evil they have ever faced: Clary's own brother. Nothing in this world can defeat Sebastian - but if they journey to the realm of demons, they just might have a chance. Lives will be lost, love sacrificed, and the whole world will change. Who will survive the explosive sixth and final instalment of the Mortal Instruments series? Love the series? Don't miss The Mortal Instruments: City of Bones movie.